This week our team reviewed a case of a patient who had a Total Abdominal Hysterectomy (TAH). Apparently, the operation was unexpectedly challenging due to the rather large uterine size. I am not aware if a curette was performed prior to hysterectomy. The gynaecological surgeon decided to transect the uterus at the level of the isthmus to gain easier access to the pelvis. Unfortunately some spillage of uterine content was noted and indeed, histopathology confirmed the presence of a uterine sarcoma. In the US, the FDA express growing concern that the use of power morcellators will spread tumour cells into the peritoneal surfaces of the pelvis and the abdomen. Tumours that have been potentially curable are disseminated by the use of morcellators and become deadly. Hence, the FDA advocates for the ban of power morcellators in gynaecological surgery. Lawsuits against gynaecological surgeons who used power morcellators to extract myomas and other specimens are underway. One particular patient lobbies for the total ban of power morcellators in gynaecological surgery. She was incidentally diagnosed with a leimyosarcoma of the uterus that was spread during her laparoscopic hysterectomy. While the patient received adjuvant treatment, she developed 2 recurrences already and her overall prognosis is believed to be poor. Before the adoption of laparoscopic hysterectomy we have seen manually bivalved specimens from vaginal hysterectomies. Unfortunately, not all uterine malignancies will ever be diagnosed prior to hysterectomy. Spillage of tumour may have a profoundly detrimental effect on the patient’s prognosis. Morcellation and spillage of tumour is not limited to laparoscopic surgery. In Australia, Applied Medical released a new surgical device, which allows the morcellation of a specimen within a containment system. I believe this device might become a game-changer because it allows the morcellation of a specimen within a bag and thereby protects the patient from tumour spillage. Last week, I operated on a 40+ year old nulliparous woman who had dysfunctional uterine bleeding affecting her daily quality of life for some time. In addition she noticed her uterus was multifibroid and quite enlarged. 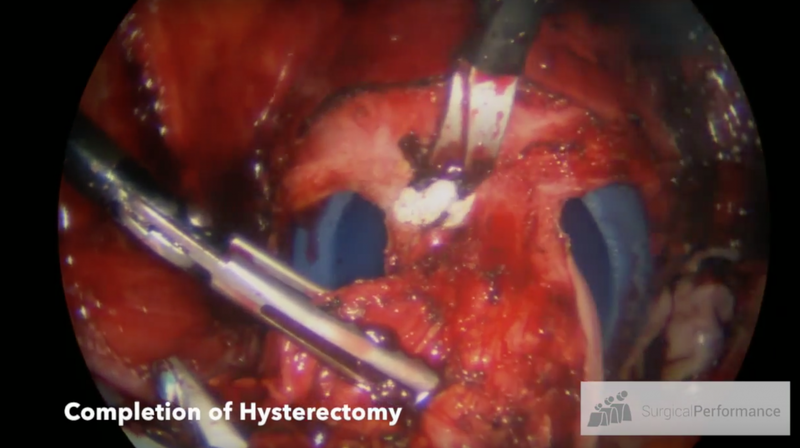 A vaginal hysterectomy was not feasible due to the disproportion of uterine size and vaginal width. With the help of the Contained Extraction System and the ColpotomizO.R. tube we were able to give her a laparoscopic hysterectomy using four 5 mm ports. The ovaries were preserved but the fallopian tubes were removed. Once the hysterectomy was completed we introduced the Contained Extraction System and morcellated the uterus in very short time. The uterus was wrapped in a plastic bag system that contained the entire specimen. There was no spillage into the peritoneal cavity. We could have also used a large endocatch but the Containment system comes with an Alexis ring that holds the open end of the bag open at all times. I did not require an assistant to keep the bag open and had both my hands free to morcellate the specimen. By contrast, traditional bags will collapse. The discussion about morcellation should be separate of power morcellators or manual bivalving the specimen or transecting the uterus etc. Disturbing the integrity of the uterus or ovary means spillage, regardless how it is done. The discussion about morcellation has taken the wrong direction. Consideration should be given not focus on banning morcellation but rather on containing the spillage into a safe bag. Spillage but not morcellation should be avoided under all circumstances because you can never be 100% certain about the presence of a malignancy. Please check out the 3-minute video on this procedure.